There are quite a number of reliable and top quality fish care brands in the market such as Hikari, Fluval, Tetra and Marineland. If you are buying your aquarium products, I would suggest you select one of these few brand name suppliers because you can be assured that the items that you purchase are top notch and guaranteed of the quality. Most of these household names offer a complete set and wide range of fish care items, accessories, foods and medicines as well. Usually I avoid buying fish supplies from unknown and other unheard of product manufacturers because your pets are precious and since you have put a lot of your time and effort taking care of them, it is only logical that you get trusted brands so that they receive the best. Most of the time, certain things like water conditioner, medicines and foods are extremely important and I don’t see any reason why you should be stingy and cut down your cost on these. For me, what I believe is that it is useless to save on some cheap products and then ended up with your pets having problems. Foods especially are very important because you might not be aware on what type of ingredient mix that are added into it and personally I found that some unscrupulous suppliers actually blend in cheap proteins that cause the fish having digestive symptoms or malnutrition problems. Sometimes what you can observe is that the fish can stay idle and takes a long time to poop which indicates that the problem might originate from the food itself and this means that it might be unsuitable for them to eat. Certain manufacturers also add in preservatives which might cause ill effects in the long run especially those with chemical additives that enhances the color (These are specially made for fish that loses its natural colors). If you notice that the fish poop is almost similar to the color of the foods given to your pets, I would suggest and tell you that it is not worth trying your luck and finish the whole can/bottle of foods. My recommendation is when it comes to feeding your aquarium fish, the most reliable brands so far are Japanese based supplier like Hikari and Tetra which will provide guaranteed quality foods and with hundreds to choose from, for example like specialized food to feed baby fish, it's a matter of spending your time to select one which is suitable for your type of fish. Note that I am not affiliated with any of those brand names at all. If you buying your first fish tank, I would suggest you go for a complete aquarium set of items such as tanks that come with equipment like heater, conditioner and filter. Rather than buying all these items individually, it would certainly be much easier if all those actually come in one package. 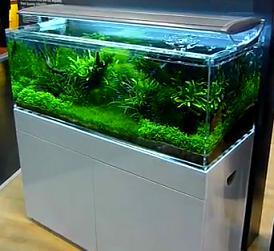 One of the benefits of having a pre-assembled aquarium is that first you avoid all the hassles of shopping one by one and second, you can be assured thing like sizing of the filter, selection on the wattage of tank heater and lighting is correct without worry of getting the wrong ones. Basically all you need to do is that once you get the items home, you just need to put everything together and the aquarium system is ready to go. Some of these top brand fish manufacturers offer a whole package setup and my favorites so far are Fluval and Marineland and if you observe the range of fish equipment offered, you will be amazed with what they have in store that covers practically everything in single setup. Of course, the last things that you want to avoid is ended up buying cheap and unreliable supplies and having unpleasant experiences like electrical shock coming from malfunctioned filter motors, heaters that overheat, constant failure of lighting lamps and leaking aquariums (I can tell you that is the worst nightmare).